Our collaboration site is Inwood Hill Park. It is the only natural forest in Manhattan. It was not designed, but rather formed by ecological and human shifts over time. We’re interested in seeing how these shifts can inform the practices of both urban ecology and dance. We will share our hybrid practice in a 2-day workshop. A large-scale quilt, inspired by a number of New York city parks, has previously been constructed. We will use it as a picnic blanket as well as a tool to map the Inwood Hill Park’s ecosystem. Finally, we will construct a patch based on our experience of Inwood Hill Park which will become the quilt’s medallion. We’ll start with a walk that identifies mapping systems used in urban ecology (particularly priority maps). We will utilize these mapping systems to determine multiple sites for a movement practice, which will attempt to map the sounds of the park. This experience will be further processed into the construction and stitching of a quilt medallion. We will start with a movement warm-up (Practice for the trees) that segues into a walk through the park. We will end by engaging in tree stewardship, specifically the task of pulling wine berry vines and garlic mustard (invasive plants that are edible but harmful to the trees). 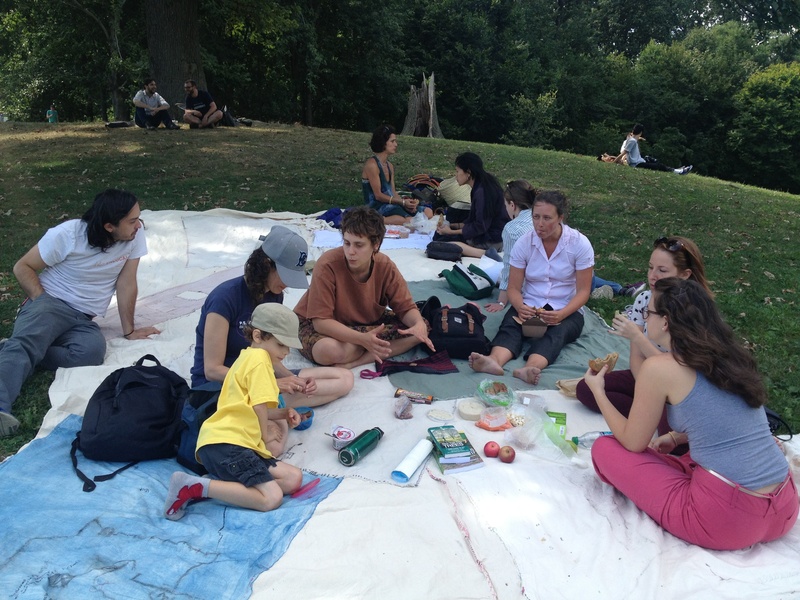 We will close by inviting participants to rest on our quilt and enjoy a picnic of Greek-Iranian pies. Meet us at the entrance to Inwood Hills Park at the intersection of Indian Road and 218th Street. There is a cafe across the street called Indian Road Cafe at 600 West 218th Street that people can get coffee/snacks in and use the bathroom before heading to the park.